Newly Published in October 2014! The Louisiana History Museum proudly announces the release of “Central Louisiana: 100 Years of Photographs & Illustrations”. 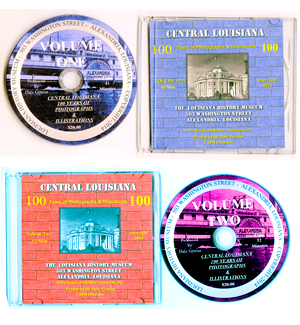 This 2-volume DVD set features hundreds of photographs of Alexandria and Central Louisiana from the 1850s to the 1960s. DVD Volume One is 41 minutes long and features photos from the 1850s to 1920s. DVD Volume Two is 52 minutes long and highlights photos from the 1920s to the 1960s. Each photo appears on the screen for about 20 seconds, with a short graphic lasting about five seconds at the beginning of each to describe the photo. There is no narration, but music plays in the background. “For the past year and a half, I have been sorting through and putting into perspective a collection of photographs of Central Louisiana that spans over 100 years,” Dale Genius, Director of the Museum, said. “It took a lot of work, and my eyes crossed many times from the strain of going through these precious images of our past.” The result was two DVDs capturing images of Central Louisiana from days gone by. In addition to providing a look back in time to the earlier years of Central Louisiana, the DVDs serve as a fundraiser for the museum, which offers free admission. The DVDs will be available beginning Tuesday, October 14 at the museum, and at Charrier and Charrier law office at 1937 Jackson St. in Alexandria. All proceeds from DVDs sold at the museum will go to the museum, while 25 percent of the proceeds of those sold at the law office will go to the Historical Association of Central Louisiana, with the rest going to the museum. Charles Charrier, from the law firm, is president of the Historical Association. If you are a historic preservation fan, or just love history, this is the DVD for you. It would also be an ideal gift for friends or family. Copyright © 2018, Louisiana History Museum. All rights reserved.